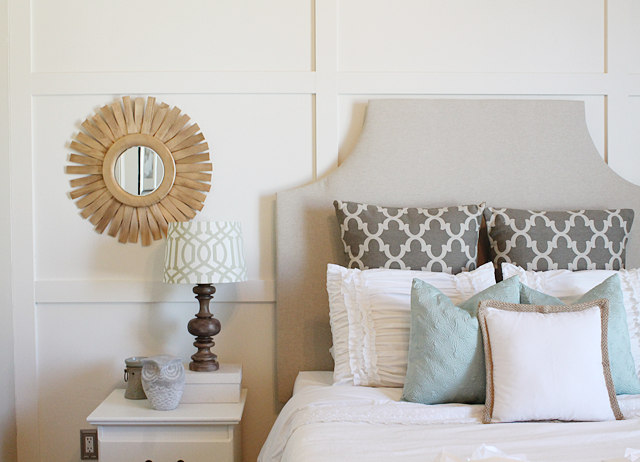 I feel like I say "Bedroom Makeover" more than any homeowner should :) But that's what happens when you like to change things up and get bored quickly. 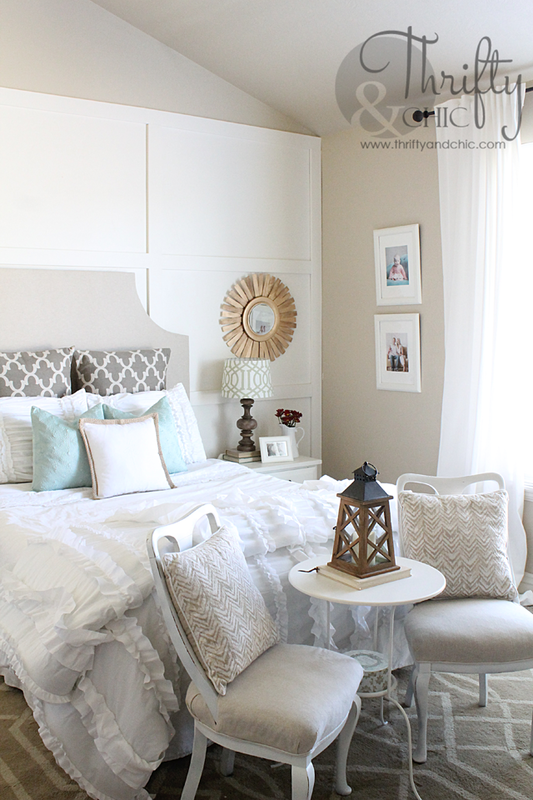 My last makeover was just a little step to get it to where it is now since apparently new bedding, lamps, and a rug only kept me happy for a few months. My bedroom from a year ago seems sooo distant in style now compared to this one. It feels like it was lacking design, where this one has a ton of it. And now it feels like a complete sanctuary. 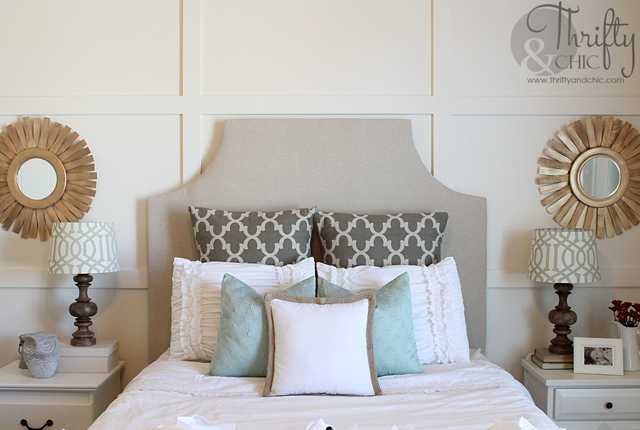 A few elements obviously went in to creating the difference: the mirrors, the new lamps, the headboard, and of course, the wall. 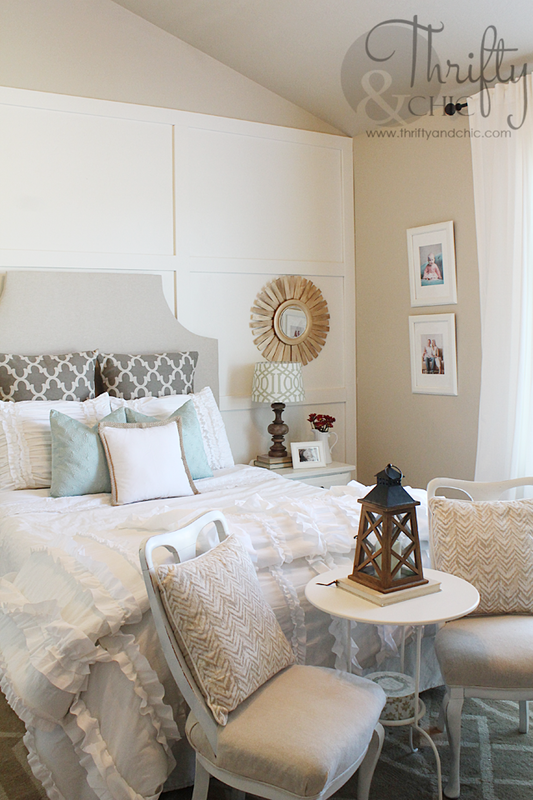 I was so happy that 3M DIY wanted to partner up with me again to help create this wall. Here is the tutorial! Boards of MDF found in molding aisle (enough that will create the height you need and width you need along with the amount of columns/rows you want) I used 3.5" MDF. The list seems long, but don't be intimidated :) It's really easy! Step 1: Paint the wall. My room has vaulted ceilings. So, I decided to paint up to the break point of the other two walls. I used ScotchBlue Painter's Tape on the top, sides and just above the molding and the ScotchBlue Drop Cloth to protect the carpet because truth is, I'm a mess when painting ;) You can paint before or after, but I chose before since I know how much of a pain it is to try to paint into a ton of corners. I used about 3 coats on my wall. 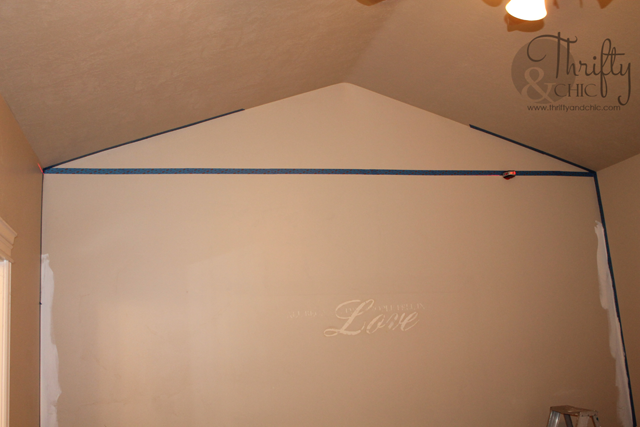 To get a good straight line when painting half a wall, use a laser level and line your tape up on the laser. Step 2: Measure where you want your boards. I wanted to three rows and three columns. So, I divided my wall up by 3rds both vertically and horizontally (not including baseboards) to get my marks. 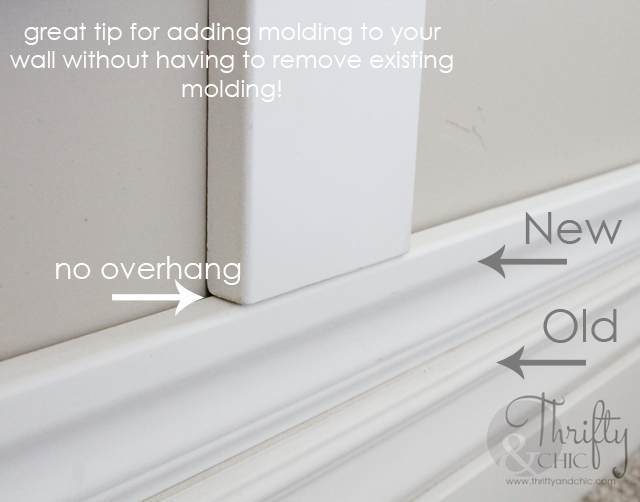 Step 3: Lay down your decorative molding, upside down, onto your baseboards. Why you ask? Well, first off, it gives you chunkier baseboards...who doesn't want that? 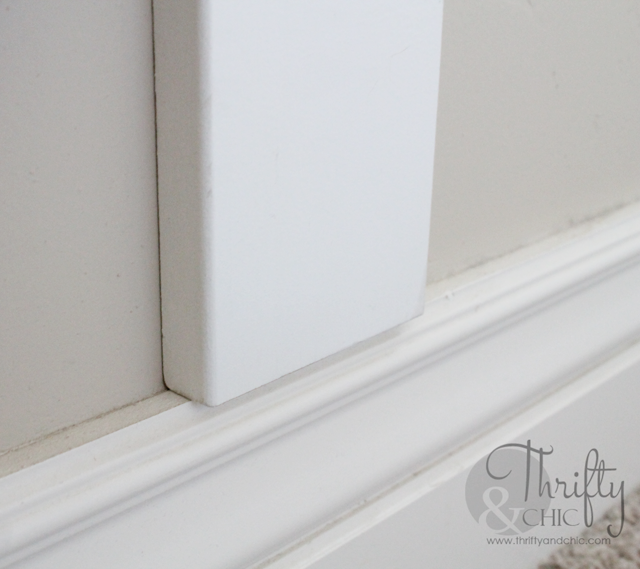 And secondly (the main reason), most MDF will be thicker than the top of your current baseboards so unless you want to rip out your current baseboards, this is an easy trick to make it look good and not have an overhang. 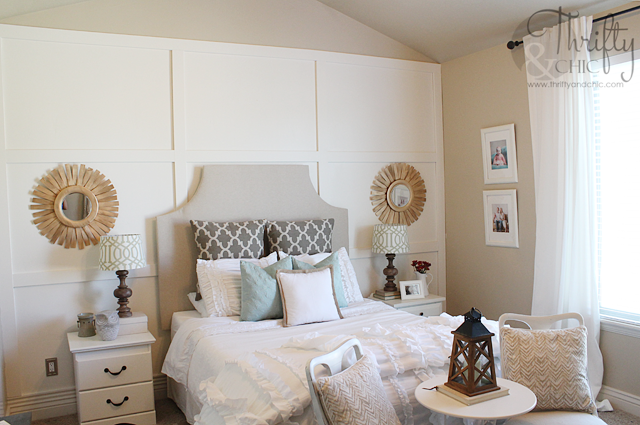 Step 4: Place your top piece of MDF horizontally across the wall if you don't have vaulted ceilings. If you do have vaulted ceilings, I didn't do this until step 6 below. Found, measured and marked where I needed the other two pieces, and nailed them up there. Now, this would be great if you did this so each of these pieces go into a stud, but more than likely they won't. So, if you are worried, you can always liquid nail these to the wall also. Step 6: Place the very top piece of MDF on top of the vertical pieces you just secured. 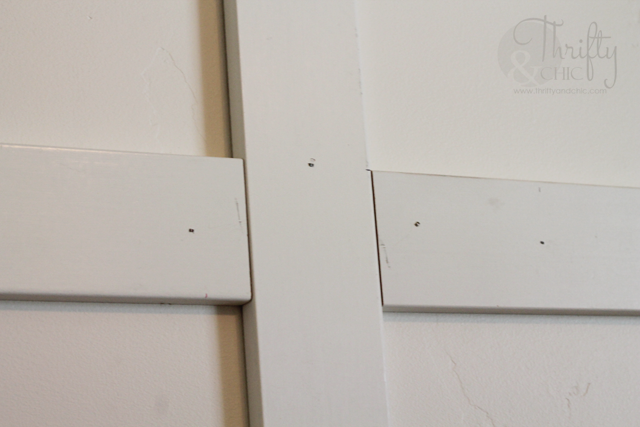 It should be level, but it's always good to make sure :) Now secure into the wall in each stud. 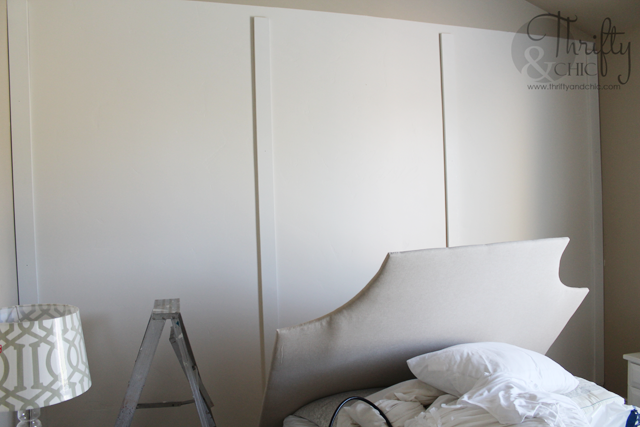 Step 8: Now place your horizontal slats at the marks where you divided your wall and secure into place. Make sure they are level. 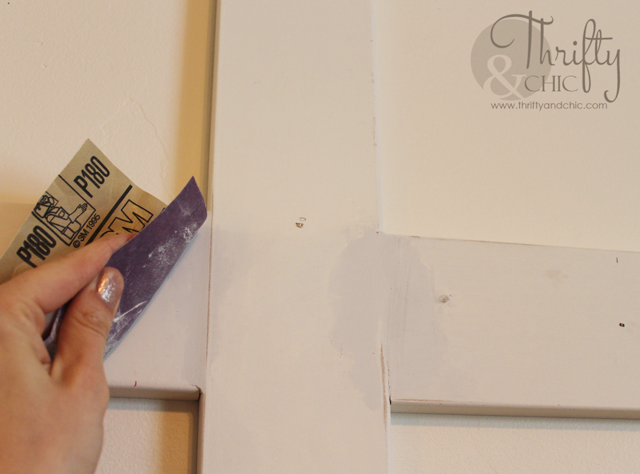 Step 9: Fill in all the nail holes and seams with 3M Patch Plus Primer. FYI guys, not just cuz this is a 3M product, but this stuff works! It's amazing; I use this stuff on everything. Step 10: Once the patches are dry, sand a way. 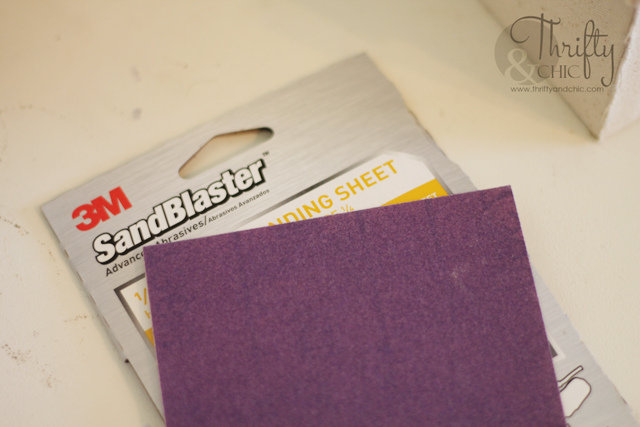 I used 3M SandBlaster Sandpaper in 180 grit from 3M Advanced Abrasives. 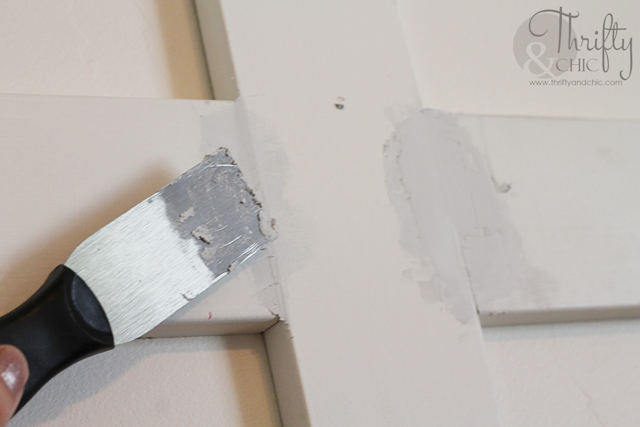 Step 11: Use the painter's tape to once again protect your adjacent walls and ceiling. 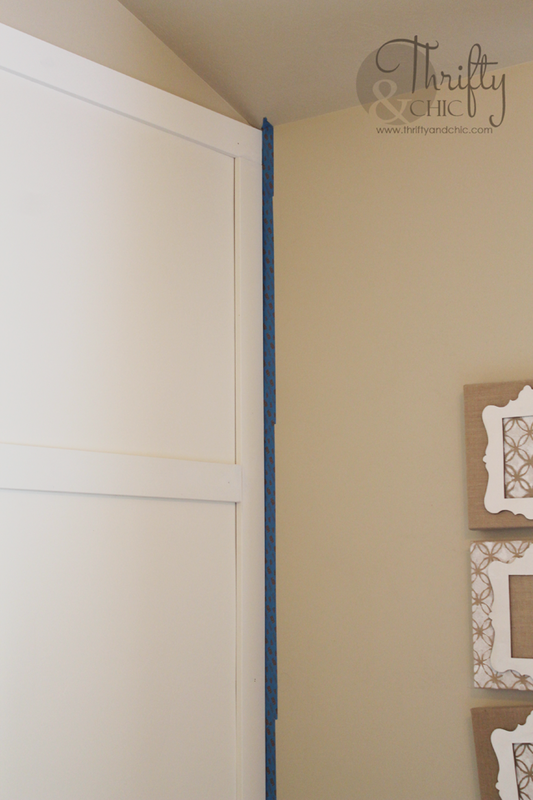 Paint the MDF and if you feel the need, paint the walls again also to make more cohesive. 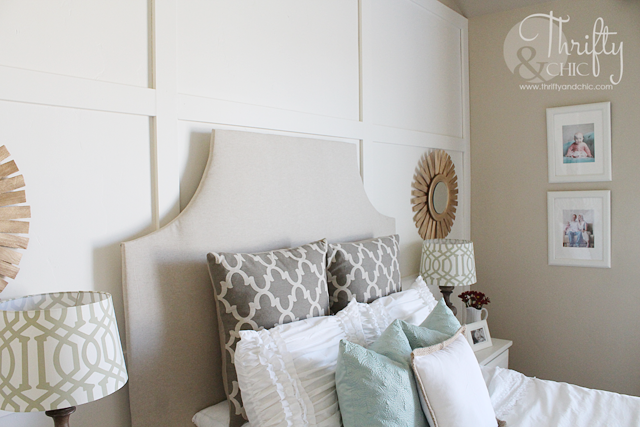 I was able to paint this with one gallon of paint ($25), 9 MDF boards ($54) and 1.5 pieces of decorative molding ($9). All for a grande total of $88. This covered a wall that is 9' high and 12.5' wide. I think it is worth the price for the amount of change it has brought to the room. I always say this, but I wish I had done this sooner. It made such a big difference. Pillows: Also just reused from other parts of house. 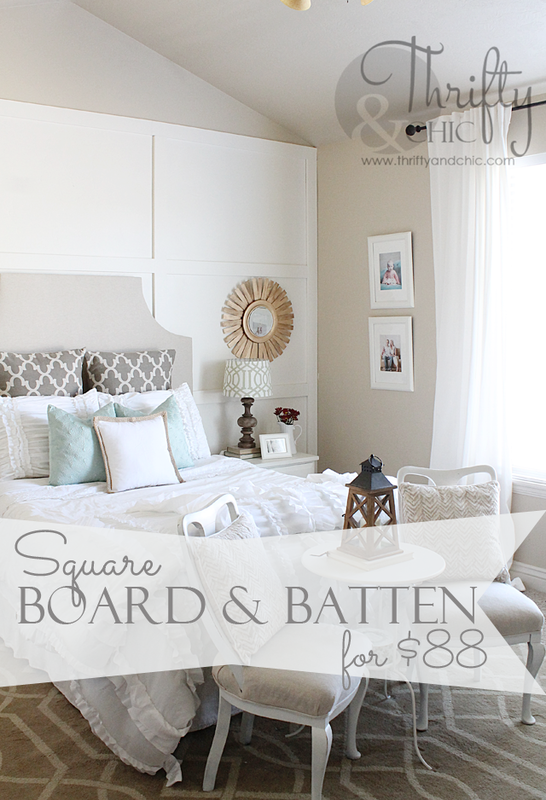 So, just about $500 room makeover to take it from ewww and dark to nice and serene :) Plus, find a cheaper or smaller rug...or no rug and that brings it down to $350. Much more manageable in my eyes. 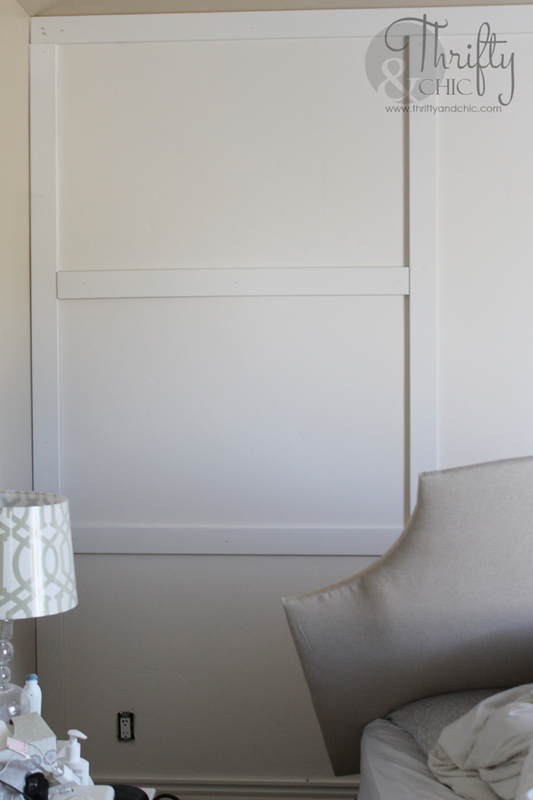 I didn't realized how beige these walls were and how they really darkened the room until I put this new wall in. Makes me want to paint the ceiling too :) Who paints the ceiling the same color as the walls? Ugh, it drives me nuts! lol ..and 20 foot ceilings are not the easiest things to paint. 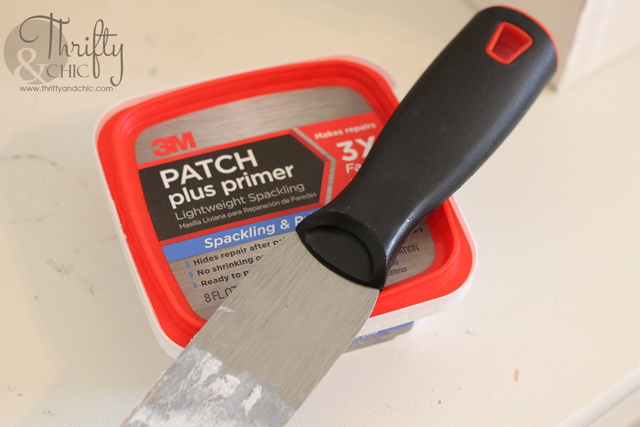 To find more inspiration and a ton of other projects from 3M DIY bloggers and experts, be sure to check out their social media pages! BEAUTIFUL! Although... I love just about everything you do. I love following your blog and seeing all your great ideas. 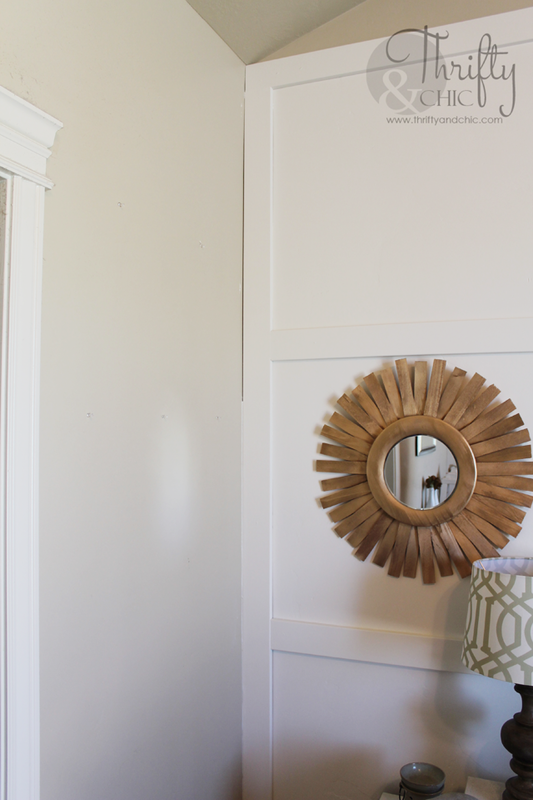 Where did you get your sunburst mirrors for only $20? They are beautiful! This is gorgeous. I'm not one for frilly, girly things (my tastes run more toward the gothic, Addams Family decor, but my mom would love, LOVE this and I'm not so shabby in the DIY department. Looks like a project we can undertake! Thanks for posting! Hi. 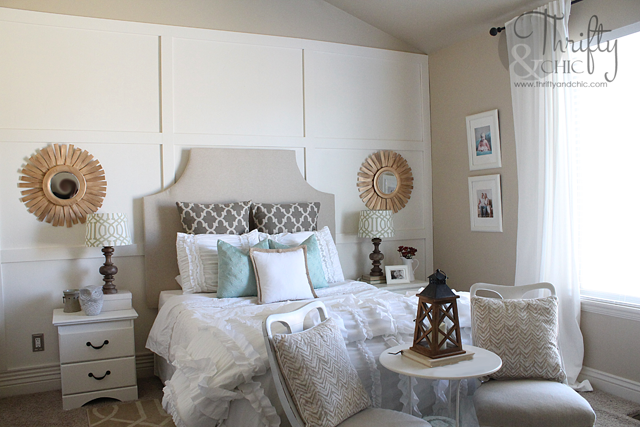 You have the same baseboards that I do and I want to do something similar to this. 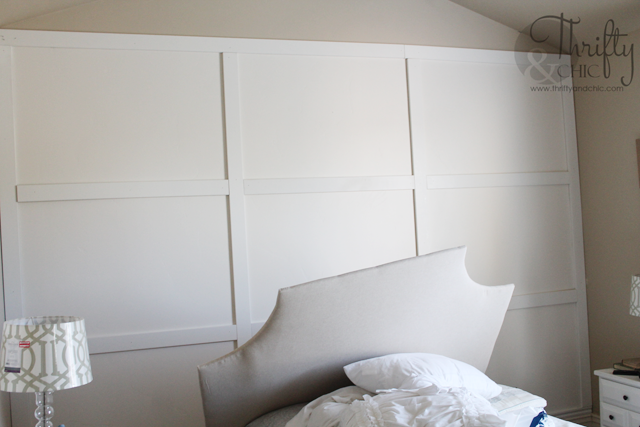 What was the thickness of the MDF boards you use for the vertical and horizontal pieces (1/2", 3/4")? 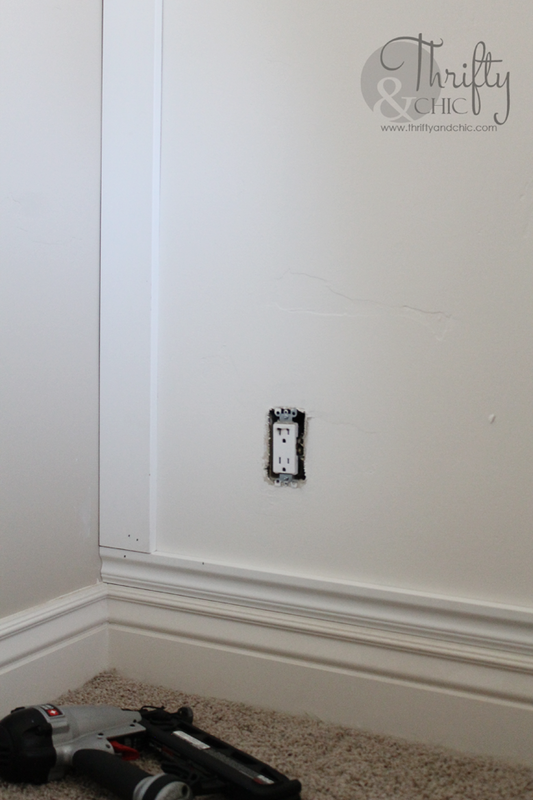 Also, what is the name or style of the baseboard that you added to your existing baseboard to make the board & batten blend in without the overhang? Thanks. Your bedroom is lovely.